I am a massive fan of Mooff Games. For many years now they’ve been putting out quality experiences on iOS, first with many bear-related puzzle games and then on to homages to video game classics. Toon Shooters (Free) was a 2012 homage to R-Type and similar old-school scrolling shoot ’em ups, while Maximus (Free) came a year later and was a love letter to Golden Axe and all the classic beat ’em ups of the arcade era. Their last game was 2014’s Blackmoor (Free), an action platformer with more than a few nods to Castlevania and the like, and curiously, combat mechanics that felt lifted straight from Street Fighter II. That last bit is significant, as many Blackmoor players commented that the combat mechanics were so good that Mooff should just make a straight up fighting game. It turns out that’s what they were planning on doing, by throwing all the various characters who have appeared in their games over the years into one massive fighter. It’s been a couple years in the making but Super Boys – The Big Fight (Free) is that game, and while it’s far from perfect, it’s a glorious homage both to fighting games in general and fans of Mooff. Super Boys is set up like a TV show fighting tournament, sort of like Smash TV, with an over-the-top announcer, a studio audience, and fabulous prizes. At first you’ll be confined to the single-player tournament which has you fighting up twenty floors of a massive tower with each floor containing four normal fights followed by a boss fight. Once you’ve beaten the first floor, you’ll be given a second character as a prize, and introduced to the mechanics of setting up and upgrading your own team of fighters. Fighters are unlocked at random in a draft, which may or may not bother you depending on how badly you want specific characters. There are a lot of characters in this game, more than fifty in fact. They range from one star to four stars, and there’s a cap on how many stars can be on any given team for balance reasons, so you can’t stack too many strong characters together. 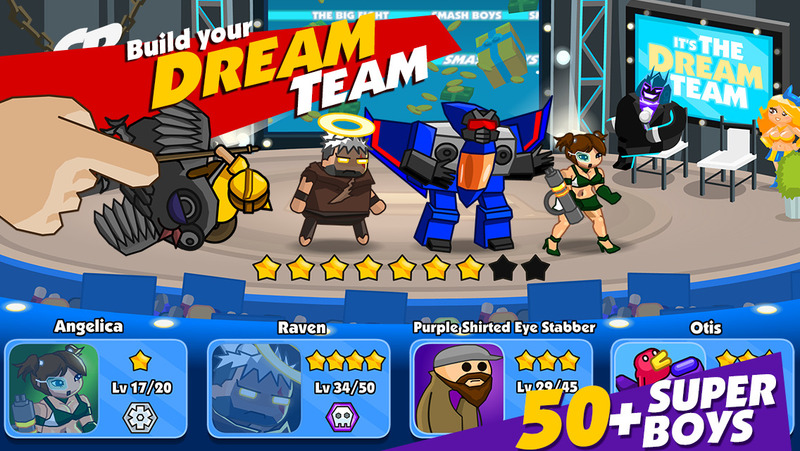 You can mix and match characters within the star allotment, as well as level up and upgrade characters individually and for your team as a whole. There’s really a whole lot of RPG-style collecting and upgrading to be done in Super Boys. The actual fighting is something of a hybrid between traditional Street Fighter II-style one-on-one fighting and Super Smash Bros.-style arena fighting. It’s frantic, chaotic, and loads of fun, it does have some issues. With so many characters on screen at once the game can get confused as to who your fighter is actually focusing on. The camera can get a little wonky too trying to follow all the action. A few players in our forums have reported problems with the control stick too, which Mooff is already looking into. There’s also the pay model to consider. Super Boys is free to play, and while it’s pretty tame it’s still bound to turn some people off. There’s an energy system, but you’re only docked energy if you lose a match, so it doesn’t punish you for doing well like some f2p games. The recharge times are also fast. The energy system hasn’t prevented me from playing even once yet, but that begs the question, why is it there? In addition there’s two in-game currencies (well, three if you count the ones you can use to recharge your energy). First there’s Coins, which are doled out generously, and mostly go towards upgrading your characters and team’s stats. Then there’s Gems, which are used for unlocking new characters randomly through the Draft. Being a Mooff game, the characters are mostly parodies of popular characters from TV, movies, video games and pop culture, all culled from previous Mooff games. The Gems aren’t given out quite as frequently, as expected, but they can be earned just through playing as well as bought through IAP. Overall it’s a very typical free to play system. So I know what you’re thinking. In a week where the likes of The Room Three ($3.99) was released, how is this free to play game with noted issues our Game of the Week pick? Because despite any issues, I’m having the time of my life with Super Boys. I already told you how I’m a huge fan of Mooff’s previous games, and I’ve been a huge fighting game fan most of my life. This game was made for people like me. It has so much heart put into it, and it really has the potential to be the “Smash Bros. of iOS" with just a few tweaks and fixes. 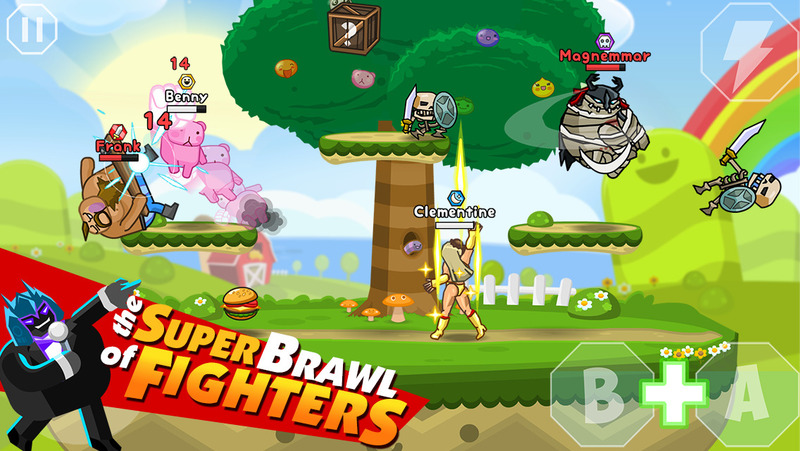 If you’re a fan of fighting games or any of Mooff’s previous games, give Super Boys a try. It’s free after all. It does have a learning curve, but it’s worth sticking with. Especially make sure you pay attention to upgrading your characters and team stats, otherwise it can feel overly difficult. Once things click though, Super Boys is some of the most fun I’ve had on iOS in some time. Oh, and as an extra little bonus, Mooff’s entire iOS library is free right now, so it’s a good time to stock up on any of their games you might have missed. Previous PostPrevious The Carter Crater: Are ‘Clash of Clans’ Clones Not Just Annoying and Unoriginal, but a Threat to Mobile as a Whole?